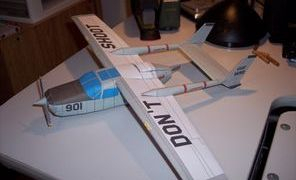 The Cessna O-2 Skymaster (nicknamed "Oscar Deuce") is a military version of the Cessna 337 Super Skymaster, used for forward air control (FAC) and psychological operations (PSYOPS) by the US military between 1967 and 2010. The USAF took delivery of the O-2 Skymaster in March 1967 and the O-2A also entered the U.S. Army's inventory during 1967, from USAF stock. By 1970, a total of 532 O-2s had been built, in two variants, for the USAF. 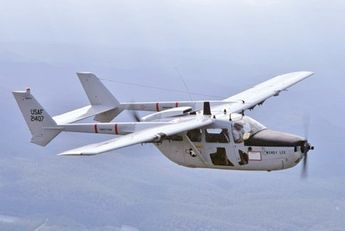 During the Vietnam War, the O-2A was introduced as a replacement for the O-1 Bird Dog, in the forward air control (FAC) aircraft and served in that role with the 20th Tactical Air Support Squadron. 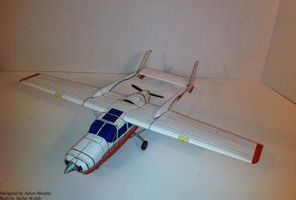 The O-2B was equipped with loudspeakers and a leaflet dispenser for use in the psychological operations (PSYOPS) role. 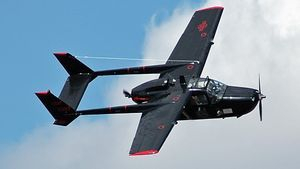 While it was intended that the Skymaster be replaced in the FAC mission by the OV-10 Bronco, the O-2A continued to be used for night missions after the OV-10's introduction, due to the OV-10's high level of cockpit illumination, rendering night reconnaissance impractical.The O-2 was phased out completely after additional night upgrades to the OV-10. A total of 178 USAF O-2 Skymasters were lost in the Vietnam War, to all causes. 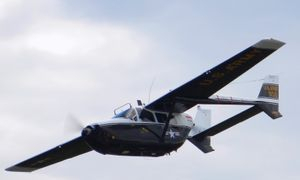 Following the Vietnam War, the O-2 continued to operate with both U.S. Air Force and Air National Guard units into the late 1980s.